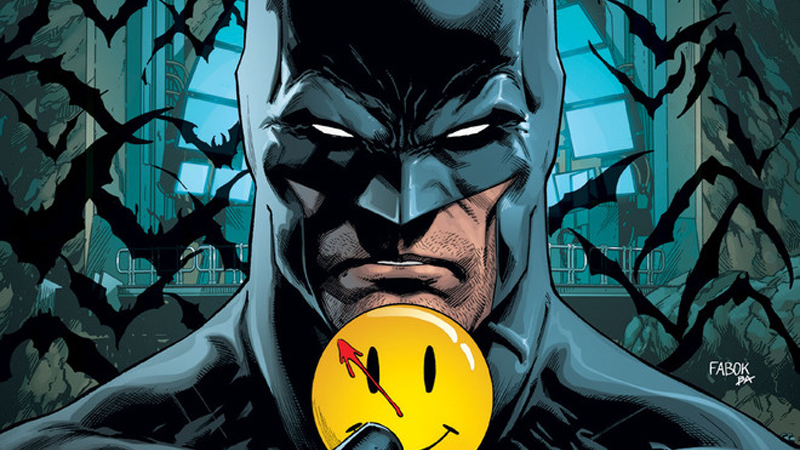 When DC Rebirth kicked off, Batman found the blood-dripped badge of the Comedian embedded in the wall of the Batcave, leaving him very confused but confirming to us that the world of Watchmen was coming to the DC universe. Since then, nothing much has really happened with it—but starting this April, that will change. DC has announced a four-part story arc, ominously titled “The Button” in issues 21 and 22 of both Batman (from Tom King and Jason Fabok) and The Flash (from Joshua Williamson and Howard Porter), will begin to unravel the next step in Rebirth’s Watchmen mystery. However, Barry and Bruce won’t just be solving where the strange artifact came from—apparently a mysterious third party will discover the badge, too, turning the Dark Knight and Scarlet Speedster’s investigation deadly. DC teases that the perpetrator will be “not who anyone suspects,” which naturally, given that it’s comic books, means it’s going to be someone we already suspect. Could it even be a member of the Watchmen? We’ll find out in a few months.